Now in its third generation as a friendly and knowledgable family business, Cornetta Bros. 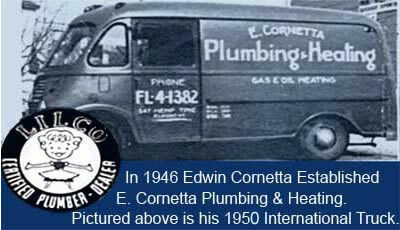 Plumbing and Heating all started in 1946 with Edwin Cornetta. As the business grew, and Edwin's family grew up, he was eventually joined by his three sons Edwin Jr., Joseph (known by everyone as Chick) and Robert (Bobby). As their family continued to grow the tradition continued with Chick and Bobby’s sons Joseph and Steven earning their master plumber's licenses. Edwin's hard work and leadership paved the path for today's Cornetta Bros.. His compassion and trust was evident in the early 1960’s too. As the neighborhood connected to the public sewer system many homeowners were unable to afford the several hundered dollar job. Edwin often told his customers, "Not to worry. Pay me when you can”. The work was completed and Edwin was eventually paid. These work ethics and personal customer relationships Edwin built his business on still hold true today. Today our staff includes four licensed plumbers and three New York State certified backflow inspectors. Our careful eyes closely supervise all work performed and always with a satisfaction guaranteed. We answer our phones in person. There's no need to “press 1 to speak” because our office is anchored by the wives of the Cornetta plumbers.